A 1000 km Audax, long-distance cycling event from the Lancashire coast to Fort William and back again - in a weekend! 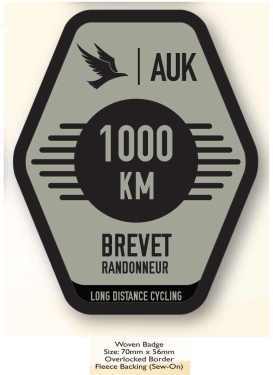 The Fort William 1000 is a 1007 km cycling event sanctioned by Audax UK, taking place over the weekend of 05 - 08 July 2019. Starting and finishing near the town of Lytham St. Anne's, Lancashire, the event is a randonnee, not a race! Those taking part will have a maximum of 75-hours to complete the challenging 1007 km route. The route follows the A6 to Carlisle before taking B-roads to Paisley where a food/sleep station has been arranged at about 305 km. The route then follows a 400 km loop around the central Highlands passing through, or close to Inveraray; Oban; Fort William & Glen Coe before returning to Paisley at about 705 km. The south-bound route from Paisley back to Lytham is exactly the reverse as the northern route direction. An optional free breakfast, typically cereal/toast, tea/coffee/juice etc, will be on offer before the start. The event uses commercial controls throughout with the exception os Paisley, which will provide food/drink included in the entry fee. Showers and basic sleeping facilities will be available at the Paisley control (305 km & 705 km). Ear-plugs will also be provided. This is included in the entry fee. You are of course free to arrange or book your own accommodation anywhere along the route if you prefer your own comforts/privacy but you will have to pay for this yourself. Your drop-bag will be returned to Lytham sometime during Sunday/Monday ready for your arrival! Most riders will use a standard road bike. Tandem's; trikes; elliptiGo's and recumbant's are permitted provided the machine is propelled soleby by human muscular effort. Front & rear lights, and a rear reflector are required by UK law for night-riding. Entry fee: £57.30 when entering online through PayPal on the AUK entry webpage. n.b. non AUK/CTC members will see £3 automatically added to include temporary membership for insurance purposes! Entry fees are non-refundable and will be taken at the time of entry. The entry fee won't fluctuate during the time period that entries remain open. Online entrants will usually receive email confirmation within 72-hours of entering. To enter, click on the "entry details" link at the top of the page and follow the instructions. This link should eventually direct you to the "enter" page on the AUK website! ** 1000 km not enough?